Beadboard gives a new look to a room, but it's not the best choice for installing over tile. Installing bead board over ceramic tile can be done, although it is not highly recommended. If a ceramic tiled wall butts up evenly with a door jam, installing bead board over the tile will pose a problem when trying to open the door all the way for rooms in which the door opens into the room. Electrical outlet boxes will have to be moved out in order to compensate for the added height of the bead board. If the box is behind the existing tile, you may have to remove a few ceramic tiles to get to it. Make sure that the small backsplash on the bathroom vanity is wide enough so the bead board does not hang over the edge. Base boards stick out further than the wall, so you need to determine if your existing trimwork sticks out far enough to accommodate the bead board or if you will have to remove it and install new, thicker base boards. Heavy-duty construction adhesive like Liquid Nails or DAP 2000 Heavy Duty Projects Construction Adhesive. 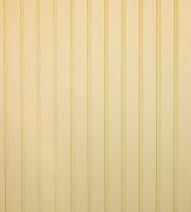 Bead board or wainscoting-specific trim: Trim made specifically for bead board can be found next to the packages of bead board at your local home improvement store. Wood trim: Purchase new wood trim if the existing baseboards are not thick enough to accommodate the extra width of the bead board. Thoroughly clean the ceramic tile. Use a strong cleanser and degreaser to make sure that all dirt particles are removed. Abrade the surface. Use a low-grit sandpaper to remove the ceramic tile glaze. Roughing up the surface of the ceramic tile will ensure a stronger adhesive bond. Remove dust particles created from sanding the surface. Use a tack cloth to make sure that all the dust is removed. Remove old baseboards and install new ones. If you have determined that you will need new baseboards, install them before installing your bead board. Measure and cut your bead board panels. Cut only a few at a time so that you can make adjustments for surfaces that may be uneven or if you have to cut out areas for light switches and electrical outlets. Apply heavy duty adhesive to the back of the bead board. Using a caulking gun, apply the heavy duty adhesive in and "S" pattern. This type of pattern ensures that your bead board will adhere evenly. Install the bead board over the ceramic tile. Press the bead board firmly from top to bottom and side to side. Paint. Apply at least two coats of paint in the color of your choice. Take your time when you are installing new baseboards. Make sure that the baseboards are level all the way around the room. If the baseboards are uneven, the bead board will be uneven. Double check your measurements. Avoid a lot of frustration by making sure all of your measurements are correct. If you are installing in damp or wet areas, once the bead board is completely installed, seal all openings susceptible to moisture and steam with clear caulking made specifically for kitchens or baths. General ideas of these areas are where the bead board and trim meet and at the tongue and groove joints. Clean up any adhesive accidents immediately. Use a damp, warm washcloth to wipe smears or spills clean. Once construction adhesive dries, it is nearly impossible to remove and will be very noticeable if you try to paint over it. When calculating how much bead board you will need add at least 5 percent more. Do this to account for waste (full boards that had to be cut to fit and the remaining cannot be used) and mistakes.